Spark Solutions Group was struggling to keep up with modern marketing trends, leading to an inability to stay relevant to their prospective customers. New competitors entering the market meant they had to adapt to new marketing trends more quickly. To stay ahead of the competition, Spark needed to engage with a new marketing agency. 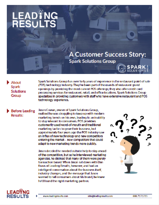 After interviewing, and then engaging with Leading Results, Spark Solutions Group succeeded in attracting new customers with a multi-step, multi-tactic marketing program.